Just as a person ages, so does your cat. Cats are living longer lives than ever before, and with your help, your feline friends can live a healthy life long into their senior years. If you see any of these signs, please call us to schedule an appointment. 2. Watch your cat’s weight. Consult your veterinarian about a senior diet. Cats that are too heavy or too thin are more likely to have or develop problems. 3. Help your feline with its grooming routine. Older cats may not be able to groom themselves as well. 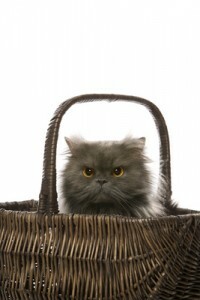 Using a brush or comb to reduce tangles and mats helps a lot and let’s your cat look and feel better. 4. Veterinary visits at least yearly are a must for the senior cat. These should include a thorough exam. Periodic bloodwork, urine checks or radiographs may occasionally be necessary for your senior feline.